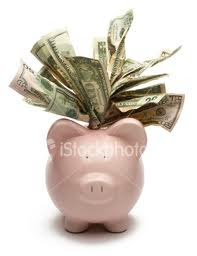 Life's Tips and Tricks: Strategies of Successful Savers! Recently, I've been reading books a lot and today, I had the chance to go over my previous readings which are of interest to me. The particular reading that caught my attention is the second chapter of the Good Housekeeping Magazine's free edition entitled Got Money Wise. This is actually a cute pocket book that comes free with my purchase of Good Housekeeping Magazine from way way back. It's so handy with only 57 pages but I found it very useful and worth reading. The question of when do we actually have to start saving was answered here. I guess, this could be as early as teenage years or even younger for as long as kids already receive a fixed allowance from their parents. This has actually inspired me to open up an individual savings account for both my son and daughter few years ago and I'm happy with the results. After putting up an initial amount, I encouraged both of them to continue saving from their allowance and extra money and watch their savings grow. So far, everything is going on fine and I'm happy that although I wasn't able to do it myself during my younger years, at least I'm able to let my kids go through with it. Setting goals will keep us inspired to work towards achieving such goals. One idea shared by someone in this book was that, we have to establish what really our goals are and a certain amount involved. There should be a time frame for every goal and goals must be set based on order of priorities. The importance of saving money for the future must be emphasized to every members of the family. Everybody must work hard to achieve the set goals. Even the kids can contribute to the realization of these dreams by being watchful on their spending. Again, we can be successful in this by avoiding unnecessary splurges. All expenses at home must be carefully reviewed. Each member of the family should be able to differentiate between "needs" and "wants". One practical advise shared by Monique Lecaros from this book is to develop a spending habit conducive to saving. According to her, going easy with credit cards is a good start. Another thing is applying the "stop and think" mode. When hit with a strong urge to splurge, ask yourself, "Would I be less of a person if I didn't buy this?" Monique said this system really works for her. Saving should be a way of life. This should be a part of our monthly routine. A portion of our earnings should be set aside for savings. Whatever is left is what we have to budget for our monthly expenses. It's such a great feeling having our savings and watch it grows. Working towards your dream is not always an easy task. We have to exert double efforts to achieve our goals. We should be in constant look out for some earning opportunities and we shall continue to educate ourselves for all the possible opportunities to earn extra money. With all these tips on hand, it is certainly not impossible for us to achieve our dreams. This can only materialize if we continue to strive for the best and apply these strategies... and become "successful savers".